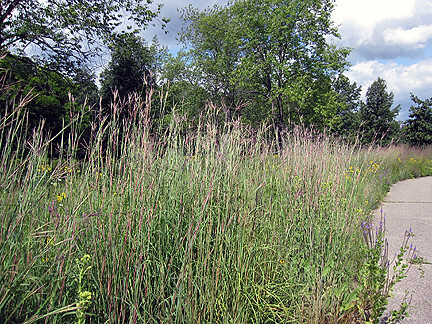 Furstenberg spans 37 acres, runs along the Huron River, and has fairly varied plant communities including wetland, woodland, prairie, and oak savannah. All of the plants I'm going to show are native to Michigan, so let's get started. 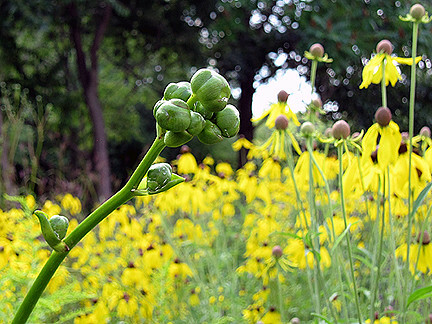 ...big burly buds of prairie dock (Silphium terebinthinaceum; say that three times fast!) — it has huge basal leaves and the yellow flowers grow at the tip of branches well over six feet tall. Yet, I'd never seen its buds. I love this photo, with grey-headed coneflower in the background. 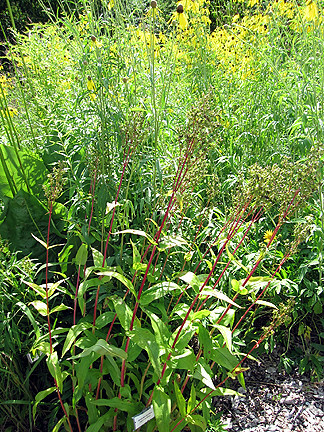 Click to see prairie dock in bloom. 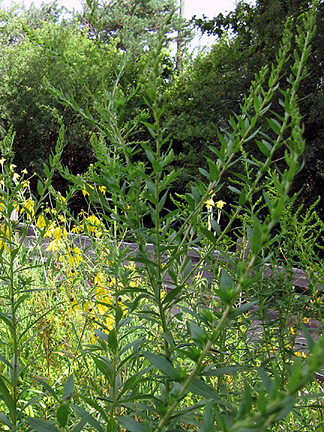 Leaving buds now but sticking with goldenrods, the aptly-named early goldenrod (Solidago juncea) is actually in bloom! 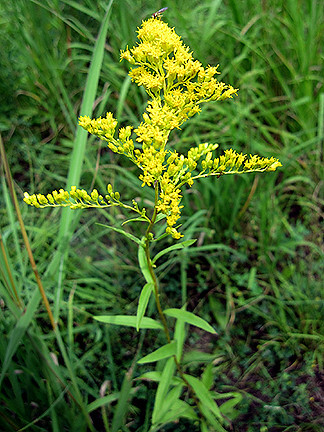 The stem of early goldenrod feels a bit waxy whereas the stem and leaves of Canada goldenrod feel a bit more fuzzy. 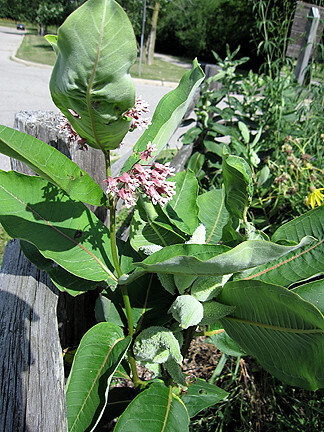 I liked how this milkweed (Asclepias syriaca) had both blooms and seed pods on one plant — it had grown a second stem in response to being grazed by deer. 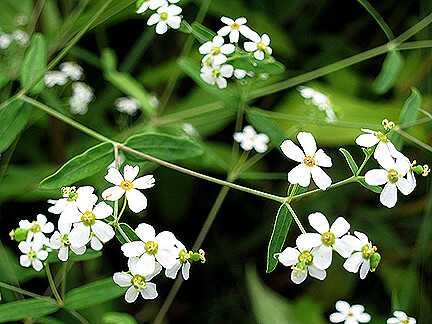 Isn't this flowering spurge (Euphorbia corollata) really cute? Noogie! This cutie is false foxglove (Aureolaria spp., possibly grandiflora but I'm not certain). 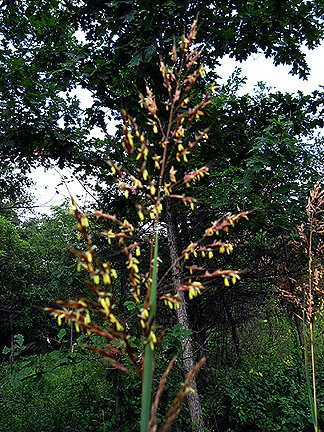 This plant is parasitic on oak roots and is an indicator plant of a high-quality oak-savannah ecosystem. 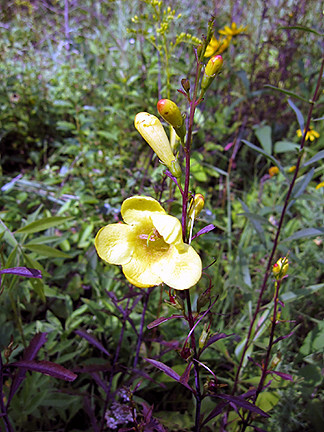 After the city did multiple controlled burns to get rid of invasive buckthorn and honeysuckle in this area, the native seeds buried in the soil (including those of this false foxglove) finally got enough light to bloom again. 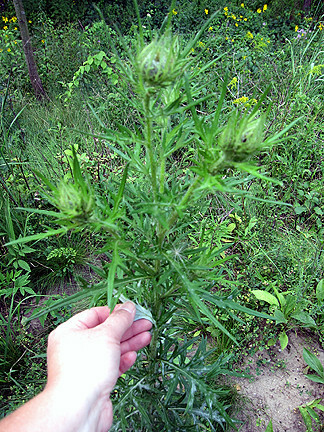 This isn't the best photo of field thistle (Cirsium discolor), but it shows two important IDing characteristics for native thistle: the undersides of the leaves are pale gray and the leaves aren't as bristly as other thistles so it's actually possible to touch it without being pricked! 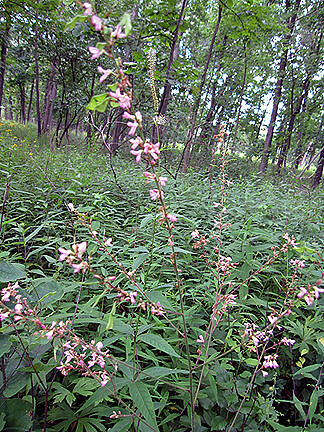 This pointed-leaf tick trefoil (Desmodium glutinosum) grows in woody areas. it was near a bench along the river. 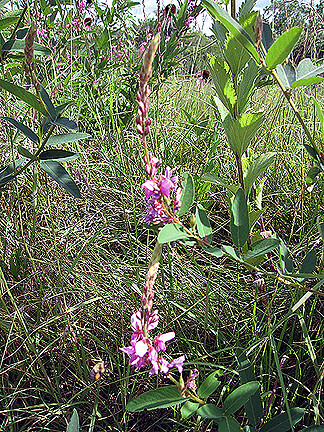 This prairie tick trefoil (Desmodium canadense) lives in (you guessed it) drier prairie conditions. 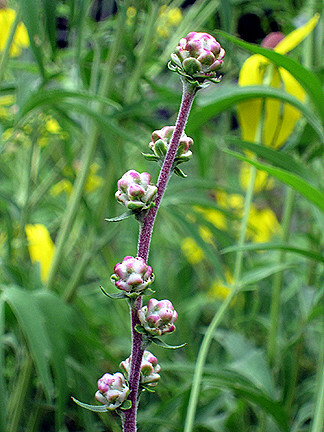 I'm pretty sure this is Stachys palustris, but I wouldn't stake my life on it. Ooh, my hand is starting to feel like a celebrity, appearing so often in this post. 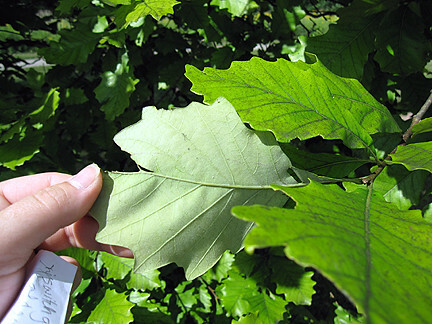 This is swamp white oak (Quercus bicolor), which as its name suggests prefers wetter areas. 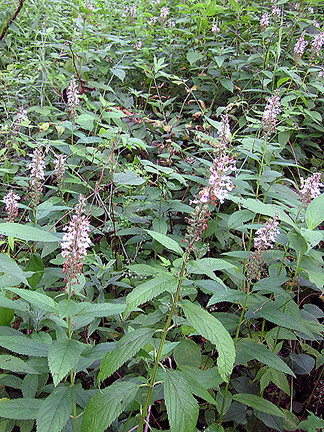 The leaves are quite leathery and pale underneath. 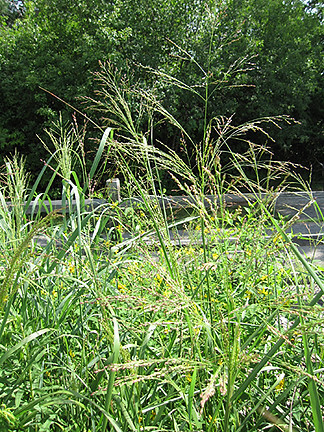 ...and of course big blue stem (Andropogon gerardii). The grass leans more toward red this time of year, but the foliage is blueish green as it first emerges. 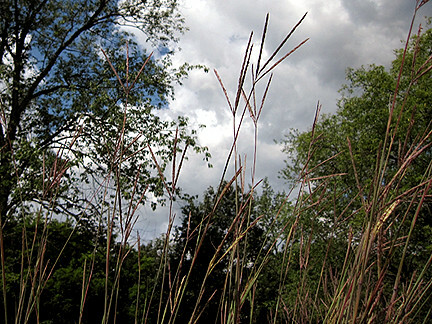 Big blue stem is also sometimes called turkey's foot because the seed heads sort of resemble that shape. Well, I hope you enjoyed our little walk. Let's sit now and have some lemonade! Monica, that was a great prairie walk. I went on my own prairie walk last evening. Saw a few of the natives but also a lot of aliens. Found one common milkweed with a monarch caterpillar which thrilled me. Thanks so much for the tip on identifying dragonflies and damselflies. I'm thrilled to have learned something today. Monica, I am so impressed at your ability to identify all these natives! Even with the wildflower guide I took along on my walk with Beckie, I had trouble identifying some of the plants, especially the yellow-flowered ones that look so much alike. I really enjoyed this walk with you; even though we share many of the same native plants, you have some different ones that I've either never seen before or haven't noticed. The false foxglove is definitely a pretty! That's a plant I haven't seen before. I really love grasses....I have many in my garden. I know some say they are untidy but I love that look. Tku for such an informative post....and I love buds to!! 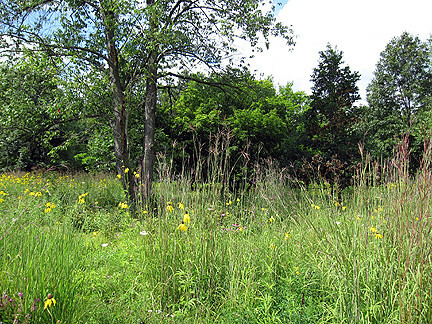 Native plants in their natural habitat is a favored topic of mine to read. This is a wonderful post with lots of neat flowers and I think you did great identifying them. What fun it would be to do a prairie walk with you. You could answer all my questions. This area looks great. The foliage of the false foxglove is really nice. Me really wants one for the garden. I love those buds! They're really sculptural, aren't they! The swamp white oak looks interesting. I've always liked oak leaves and am fascinated by seeing the variations of shape etc. What a great place! 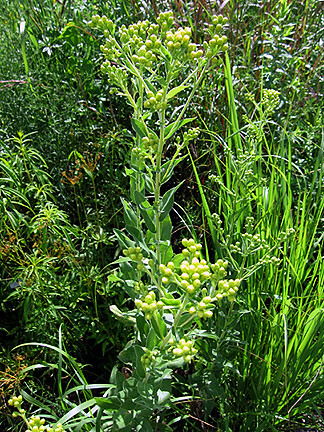 I think Solidago rigida is my favorite Goldenrod, and Euphorbia corollata is a plant I have long admired. I even tried to get one to plant in the garden years ago, and nobody had it. It's become more available now, not that I've gotten one yet. Monica, what a wonderful tour you had and shared with us. This place is just full of beauty. I really liked the false foxglove and the gray headed coneflower. I see them here along the roadsides but didn't know the name. :) How great to have a friend who gives demonstrations about native plants, too. I really enjoyed seeing your prairie natives-thanks for taking us along! Thanks for the lovely tour! 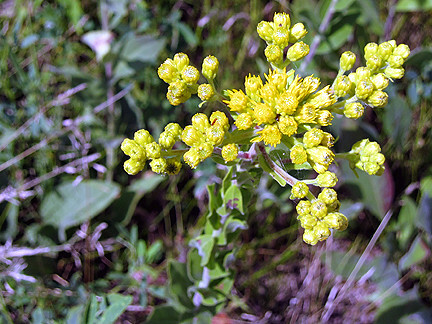 Euphorbia corollata is one of my favorite wildflowers. I am just going to echo everyone else and bow to the awesomeness of your knowledge. Hey Monica, thanks for the native walk, I really enjoyed it - you've got some gorgeous native plants round you! Bit of a feast this. I feel tired from walking without leaving my screen! Thanks for becoming a follower of The Third Column, Monica. It's good to see your photo there.